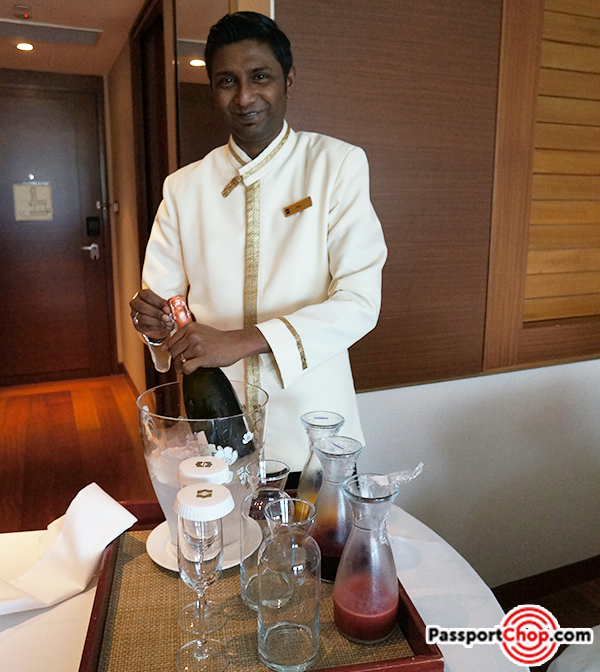 Time Out Weekend Staycation at Shangri-La Hotel Singapore – Bellini Hour, Three-Tier English Afternoon Tea, Movie Marathon – Perfect Weekend Escapade! Over the weekend, we were so pampered by Shangri-La Hotel, Singapore’s latest “Time Out” weekend staycation package – buffet breakfast at The Line, three-tier English afternoon tea at Lobby Court, an extensive in-room movie marathon menu and more! 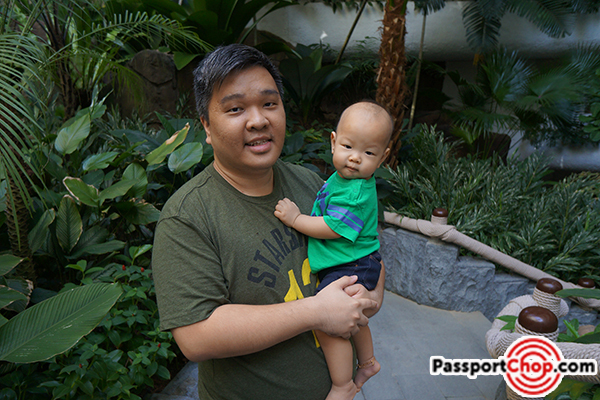 We had stayed at the Garden Wing of Shangri-La Hotel, Singapore before – but this time round, these extra perks made the whole staycation experience an much more enjoyable one. 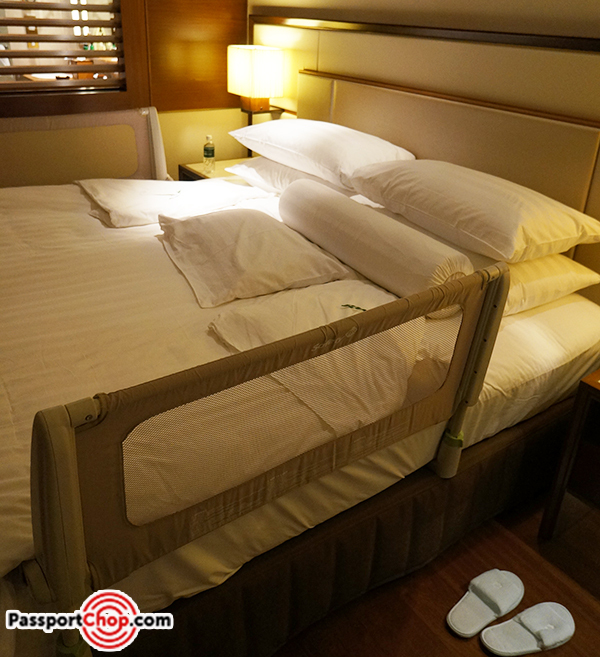 This time round, we stayed at the spacious Shangri-La Garden Wing deluxe room. 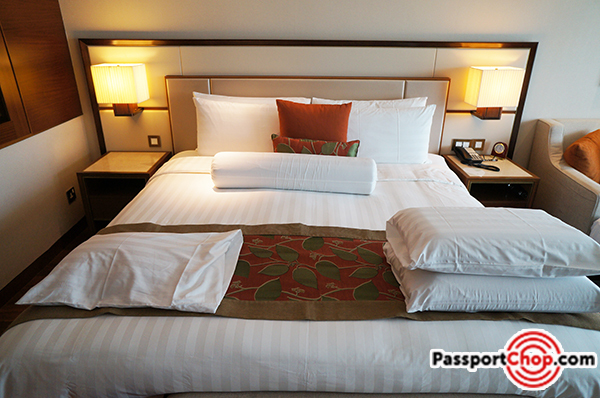 We were very impressed with Shangri-La’s services right at the point of booking – besides our booking confirmation, we were also sent a guest preference form asking abt our bed preference, pillow preferences etc. – we asked for contour, buckwheat, foam pillows and a bolster and we got it all on our bed when we checked in (as you can see in the picture below). Our deluxe room also comes with a luxurious marble-clad bathroom with double sinks, bath tub and glass-enclosed shower. I requested for a rollaway bed (up to one rollaway bed is permitted per room, subject to availability) and it was all set up when we checked into our room – the room was so spacious that even with this rollaway bed, there is still a lot of space for us to walk around. It was set up right beside the sofa, effectively “enlarging the bed size”. 🙂 Perfect setup for a movie marathon night! 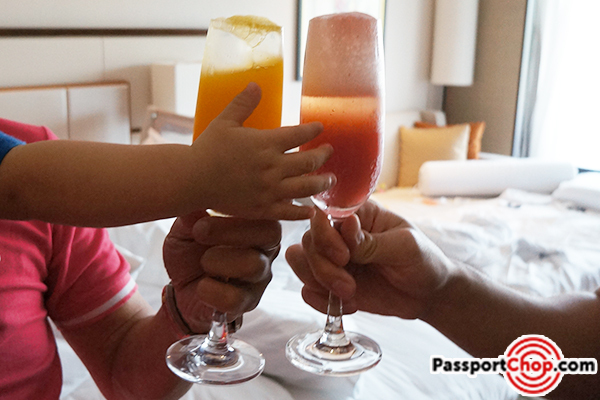 One of the highlights of the Shangri-La Hotel’s Weekend “Time-Out” staycation package is Bellini Hour. Arrange with your friendly Garden Wing staff your preferred Bellini Hour timing and a mixologist will come to your room to mix up Prosecco and mixers for cocktails. Our choice of Bellini cocktails – mango and strawberry. The mixologist also left us with a half bottle of Prosecco immersed in ice for us to enjoy for the rest of the afternoon. 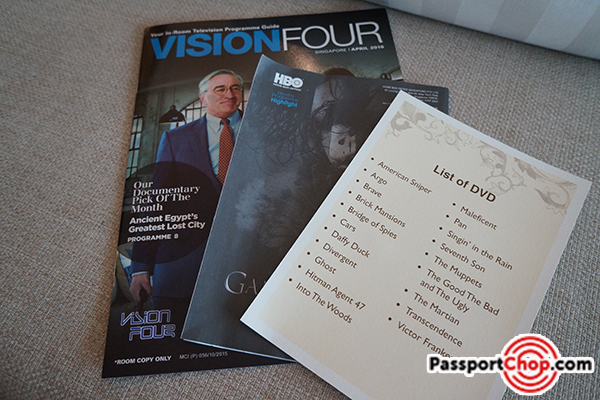 Another perk of the weekend “Time-Out” staycation package is the in-room movie marathon menu – we received a list of DVDs to borrow for free (old movies like Singin’ in the Rain to more recent ones like Bridge of Spies, Hitman Agent 47). There is already cable TV like HBO available for all Shangri-La guests and then add the in-room movie marathon menu, you can pretty much spend your staycation watching movies from the comfort of your bed if you want! If you want to go out to town for dinner or do some shopping, Shangri-La provides complimentary scheduled shuttle bus service to and from Orchard Road (with convenient drop-off and pick-up points at Takashimaya and Orchard MRT). The Garden Wing is known for its lush greenery, being an urban oasis set amongst 15 acres of tropical flora. You can take a stroll within this garden, checking out the waterfalls and flowers in the garden. At certain timing, you might also be able to catch one of the Shangri-La Garden Wing staff in action – either performing tai-chi (the real tai-chi exercise – not the “tai-chi” of pushing away responsibilities!) 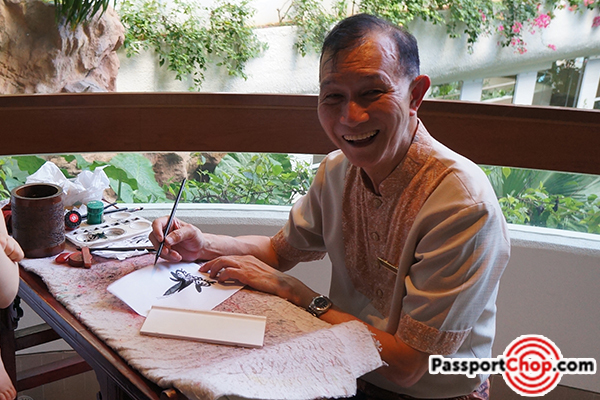 or doing some calligraphy art as you can see in the picture below. The next day, we had a choice of either a buffet breakfast at The Waterfall by the outdoor swimming pool, exclusively for Garden Wing guests, or at The Line, which offers international cuisine across 16 theatre kitchens. 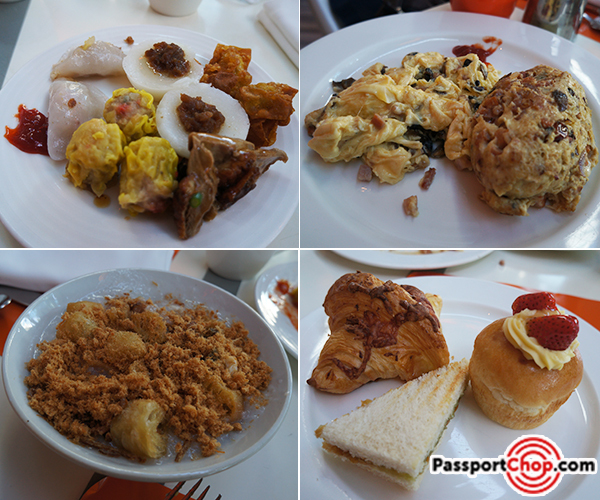 We chose The Line for its wide selection of food from dim sum, bee hoon, fried rice to a wide selection of pastries e.g. croissant and even kaya toasts. I loved the porridge section – you get a choice of chicken or fish porridge and a wide variety of condiments to add to it e.g. meat floss, youtiao, century egg. … relax in the pool on one of these gigantic swan floats! 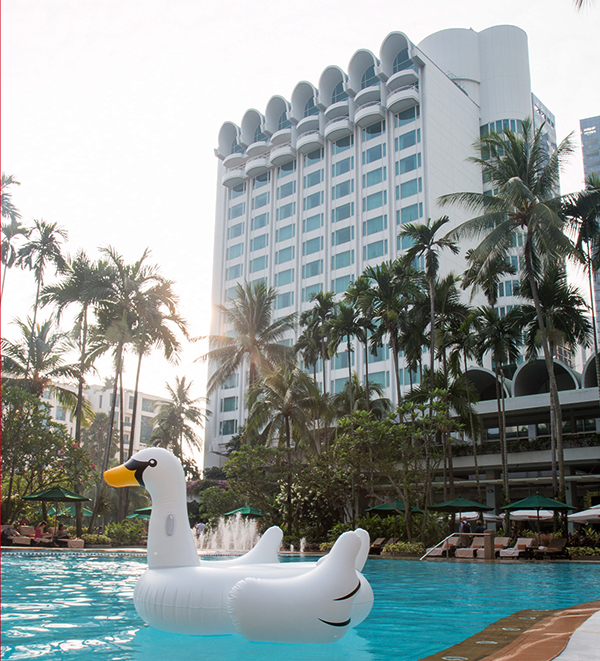 As part of your weekend “Time-Out” staycation package, you get complimentary usage of these gold or white inflatable swan floats at the pool – these are reserved for “Time-Out” staycation guests only and are very limited so “chope” one with the pool staff early! The swimming pool is very child friendly – there is a cordoned-off baby pool for the smaller kids to play in (with adult supervision) as well as these mini water fountains which are great fun for kids (like mine!). After a day of fun at the pool, it is back to the hotel for a nap and more movies! 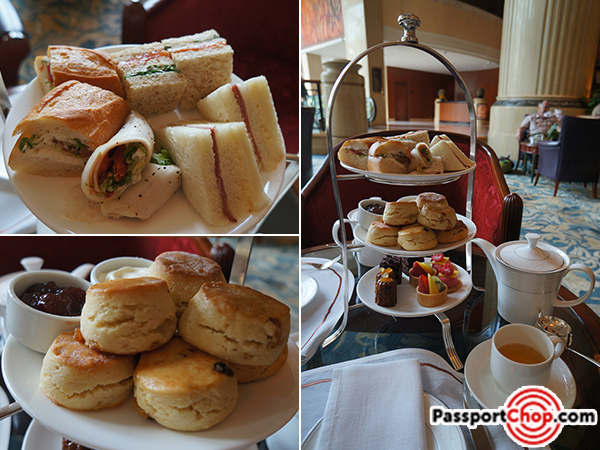 We had a full breakfast so we skipped lunch – saving our tummy for the three-tier English afternoon tea set (available from 3pm to 5.30pm daily) with tantalising warm scones, sandwiches and sweet treats at the Lobby Court, an elegant venue to take in the tropical garden environment. This is included with your “Time-Out” staycation weekend package and this complimentary English afternoon tea set for two makes the package so much more value for money – this afternoon tea set costs $42 + GST per persons so for two persons, it is almost $100+ (after GST)! The scones are absolutely delicious and so are the cakes! One thing to note – if you call reception to book your preferred timing for your English afternoon tea set, be sure to mention you are referring to the one at the Lobby Court. There is another popular high tea buffet at the Rose Verandah served in two seatings on weekends so it is almost always fully booked – the operator might inform you that the afternoon tea is fully booked (which was what happened to us). If in doubt, check with Lobby Court staff or ask the Garden Wing guest reception/check-in desk staff to help you arrange for the afternoon tea set at Lobby Court (also note that this is not a buffet unlike the one at Rose Verandah so no refills!). What stood out for me from the stay at Shangri-La Hotel, Singapore Garden Wing was the excellent service and pro-activeness of the hotel staff. Realising that our toddler will be sleeping on the king-sized bed with us, the hotel staff assisting us with the check-in asked if we would like bed rails to be installed by the side of our bed – we didn’t even know Shangri-La Hotel offers bed rails! We gladly took up the offer and they installed it for us during the turn-down service while we were out for dinner. We were also provided with Kodomo baby toiletries and pillow, even though we didn’t request for it – here you see our kid fiddling around with the the colorful toiletries bag and his small baby pillow. This package is valid until 30 December 2016 and applies to Garden Wing Deluxe Rooms. Rates start from S$465. For reservations, please visit http://bit.ly/TimeOutWnd, call (65) 6235 1666 or email [email protected]shangri–la.com. Visit http://www.shangri–la.com/singapore/ for more offers and promotions. The room rate is subject to service charge and prevailing GST. Prior reservation is required and booking is subject to availability. This offer is not valid in conjunction with any other offer and promotion.